Insurance which is provided to protect against loss by bodily injury or by health is health insurance. Health insurance usually provides coverage for medicine, visits to the doctor or medical facilities, hospital stays, and other medical expenses. Various plans are available, and there is balancing to be done in order to make premiums go up or down, the limits of coverage and the and these include raising the amount of coverage, the size of the deductible, or the co-payment while lowering the amount of monthly or quarterly premiums the insured is charged. The Patient Protection and Affordable Care Act is also commonly known as ObamaCare. 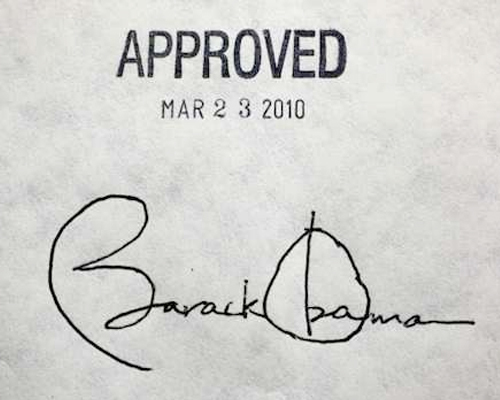 The Affordable Care Act was signed into law by President Obama on March 23, 2010 and later upheld by the Supreme Court on June 28, 2012. This law is one that most people either love or hate; the votes in both the Senate and the House of Representatives were almost entirely on party lines. mandates that most people buy healthcare insurance which complies with the federal government's "credible coverage;"
everyone receives such benefits as perinatal, pediatric services, mental health and substance abuse services. Amazingly, those who hate it point out the same facts! They assert that the United States Constitution does not give the federal government the power to mandate that Americans buy any product that they don't want or feel they need, and they decry the new taxes that the mandates carry with them. While individuals are mandated to have coverage by 2014, a special exemption was put into place last year which allows employers an extra year before they have to offer it. Critics say that places an undue burden on the middle class and the working poor, many of whom are now left to find health plans on their own, because they are required to obtain credible insurance coverage by 2014 or get a waiver, or they will pay a "per-month" fee to the federal government. The Affordable Care Act requires insurance companies which participate in the marketplace to offer four new categories of insurance to consumers. Those categories, from the lowest to the highest premiums, are called Bronze, Silver, Gold, and Platinum Plans. The Bronze Plan, which is described as having "essential health benefits," has the lowest premiums of these plans, but charge the highest out-of-pocket costs. Those who opt for the Bronze Plan will pay 40% of their medical bills, which is currently abnormally high co-insurance. But more importantly -- and less understood by many who will be buying this plan -- the average annual deductible is $5,081 for an individual and $10,386 for a family. What this means is that until the individual insured person pays $5,081 of his own medical expenses, the insurance does not kick in. Those out-of-pocket payments do not include premiums. The average reasonably healthy person does not rack up that much in medical bills in any one year, so many, if not most, people who buy the Bronze Plan will be paying 100% of their own bills for their doctor's visits. Once these facts are realized by people, one would assume many would want to leave the Plan, but that cannot be done mid-year; it can only be done during the annual open enrollment period unless special circumstances are met, such as moving to an area where the existing plan does not have a network of providers. On the other extreme, the highest premium plan is the Platinum Plan, which has a $347 deductible for individuals and a $698 deductible for a family. The average cost of a doctor visit for Platinum Plan members is $16.00, and the insured is responsible for only about 10% of the costs of their healthcare services. Insurers are not mandated to offer the Platinum Plan, and it is believed that most will not, as industry analysts believe that this plan will attract people who are in ill health, which would cost insurance companies large amounts of money, and since it is now illegal to turn people down for insurance based on pre-existing conditions, this could be financially disastrous for them. The federal law requires all insurers who participate in the health insurance exchanges to offer the two plans in between, the Silver and Gold Plans. The Silver Plan has an average individual deductible of $2,907 and family deductible of $6,078, and the average primary care provider visit has a copay of $32 per visit. The insured will pay 30% of the costs once the deductible is met. Those who choose the Gold Plan will pay 20% of covered healthcare expenses after the deductible is met. The average deductible for this plan is $1,277 for individuals and $2,846 for a family; the average office visit with the doctor is $24. In the end, the success or failure of ObamaCare and the state health insurance exchanges will not be known for a while, and in the meantime, those that love the idea will continue to find its good points, while those who do not will speak out against the bad points. One thing is for sure: The unfolding will continue to be interesting to watch. Medical insurance quotes, personal advice, and general information for Connecticut residents by a local Connecticut father and son agency. Website offers health insurance news and quotes from the top health insurance providers. Website offers free health insurance quotes online by typing in one's zip code and then one is presented with quotes. Website also offers basic information about health insurance coverage. One stop learning resource center for new Medicare beneficiaries. Whether your looking into getting Original Medicare, Medigap or prescription drug coverage, we're here to help you find the right Medicare coverage for you. Website offers information about and quotes for life insurance, as well as offering tips to obtain lowers health insurance rates. Search for Health Insurance on Google, Bing, or Yahoo!